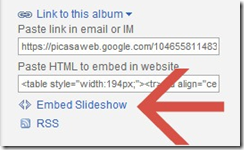 Special Features – Learn Picasa and Google Photos! 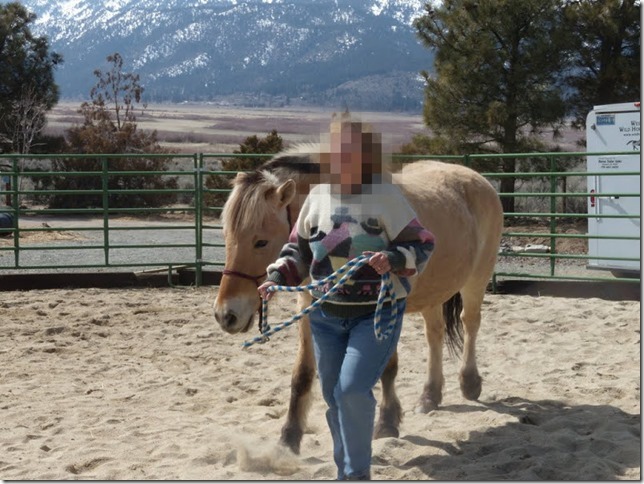 Q: I do therapy work with people and horses. 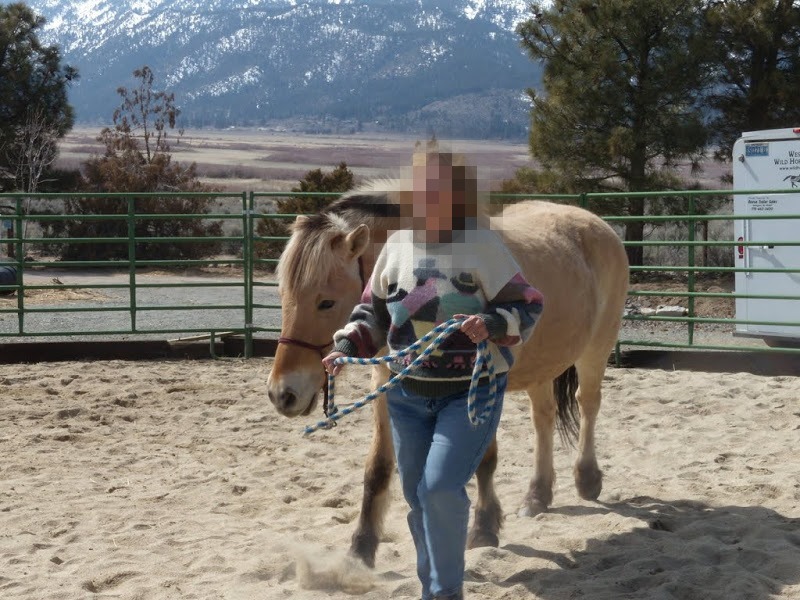 I love taking pictures while the people are with the horses, but I need to preserve their privacy before I show the pictures to anyone else. When Picasa had the Creative Kit option, I would use the Focal Pixelate feature to make the faces unrecognizable. Is there a way to do that now with Picasa? A: You’re in luck! I have discovered a way to do this. On the last tab of editing tools, you will see a Pixelate option. That will pixelate the entire picture. 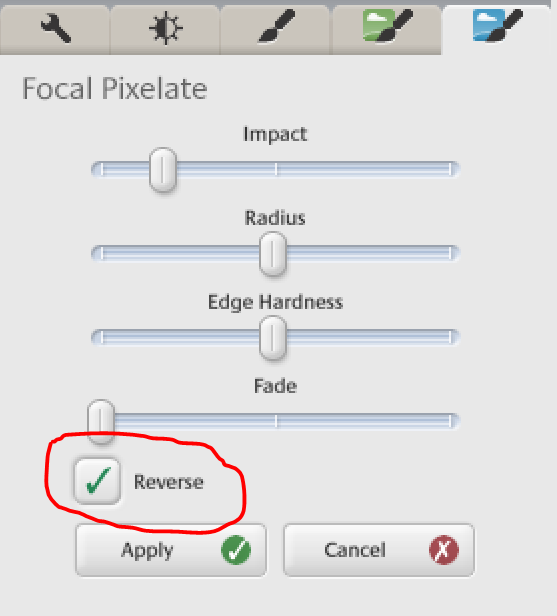 But … if you hold down the shift key, you will notice that “Pixelate” becomes “Focal Pixelate!” Who knew?! Then, there’s one last step. 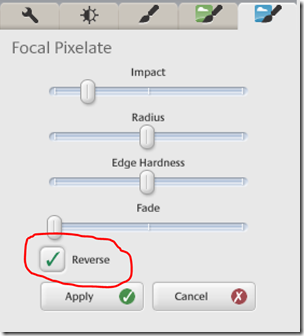 “Focal Pixelate” will pixelate the entire picture except a circle around a focal point. What we want is to pixelate only a circle around a focal point. To do that, you click on the Reverse checkbox. Now, you need to set the focal point to a face. You should notice that your mouse is a green crosshairs and wherever you click will set the focal point to that spot. Then adjust the sliders until the pixelation is strong enough to make the face unrecognizable – that’s the Impact slider. The Radius slider controls the size of the circle. Edge Hardness refers to the outline of the circle, it’s better to have it soften so as to blend with the rest of the picture. When it looks how you want, click Apply. You can repeat this process if you have multiple faces that need to be blurred. This feature can also be used to blur some text, just realize that you are limited to a circular area. 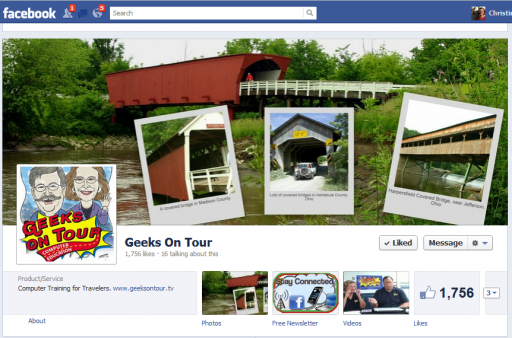 Geeks on Tour is a membership website with hundreds of Tutorial Videos on topics of interest to travelers, such as managing digital photos with Picasa, using Smartphones, Route-Planning with Streets and Trips, and sharing your travels with a website using Blogger or with friends on Facebook. You can subscribe to our free e-newsletters, or become a paid member and be able to view all of the videos in the Learning Library. Longtime Geeks on Tour member Sue Hepler, posted a message on our forum about Adding a Conversation Bubble with Text. I thought it was such a good idea, I told her I’d use it as this week’s tip. 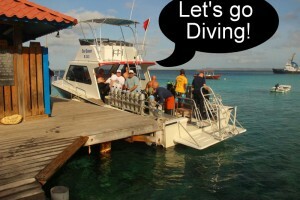 If you’ve ever used Creative Kit to add a speech bubble and despair because Creative Kit is gone … this tip’s for you! That big, black speech bubble you see in the picture at right is actually the right parenthesis character – ) – formatted in the Webdings font and resized to be very big! Then, just click somewhere else on the picture and type the words you want in the speech bubble – making sure to format them in a normal font like Arial. Color it white and move it on top of the speech bubble. If you’re on a Mac and you don’t see the Webdings font, you can turn it on in your Font Library. 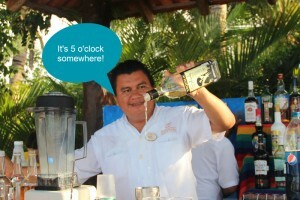 Another example is pointing to something in your picture with an arrow. Here is a previous Tip about Pointers on Pictures. That article includes some more detail on how to find these special picture characters. 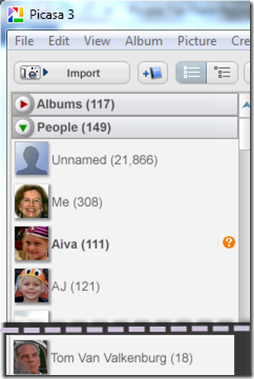 With Face Recognition in Picasa, you can work thru identifying all the “Unnamed” people in the People Albums collection or you can go thru one folder at a time and identify just those pictures you want at the time. 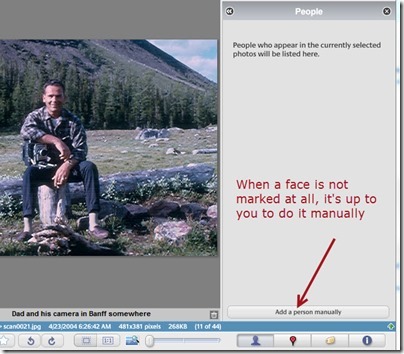 This article shows you how to go to the folder and manually identify the faces in any given picture. 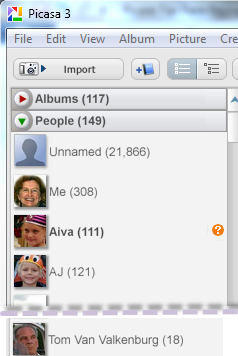 So, for example, when I look at the people album for my Dad, Tom, I see that there are only 18 named faces. I know I have more pictures than that! If only because I found some old photos once and scanned them all. I know the folder that contains those scanned pictures of my Dad, now what? Notice the 4 buttons just below the library on the right side of your screen, those open up a right sidebar or ‘pane.’ You can choose to see information about People, Places, Tags, or Properties. What you do is open the people pane. The space on the right side of your screen will now show you any faces that are tagged in the selected picture(s.) If they aren’t tagged correctly, or not tagged at all, you can fix them here. The person’s face is marked as a face but with no identification. Sometimes it won’t be marked as a face at all. In that case you need to click the button at the bottom, “Add a Person Manually” then draw a rectangle around the face, and Add a Name. 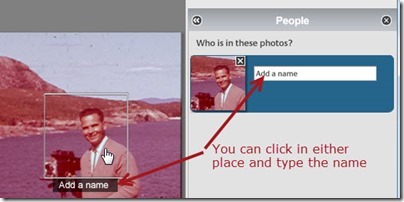 Yet another option is when Picasa has marked a face, and is suggesting a name, but it hasn’t yet been confirmed. If the suggested name is the correct person, simply click the green checkmark to confirm. If it is an incorrect name, click the red X, then enter the correct name. This should take you back to the first situation where the face is marked but unnamed, so enter the correct name. It is important to realize that these are albums, just like the ‘blue’ albums in the top section of the left sidebar. If you delete a face from a People Album, you are not deleting the photo, you are just taking it out of the named person’s People Album and dumping it back in the Unnamed album. You can also simply drag a face from one album to another if you find an incorrectly tagged face. Brought to you by Geeks on Tour! There’s a lot more to know about the face recognition feature in Picasa. We encourage you to read the other articles in this website that refer to face recognition and, if you are a member of the GeeksOnTour.TV website, you should watch the video in the Picasa Special Features series on Face Recognition. 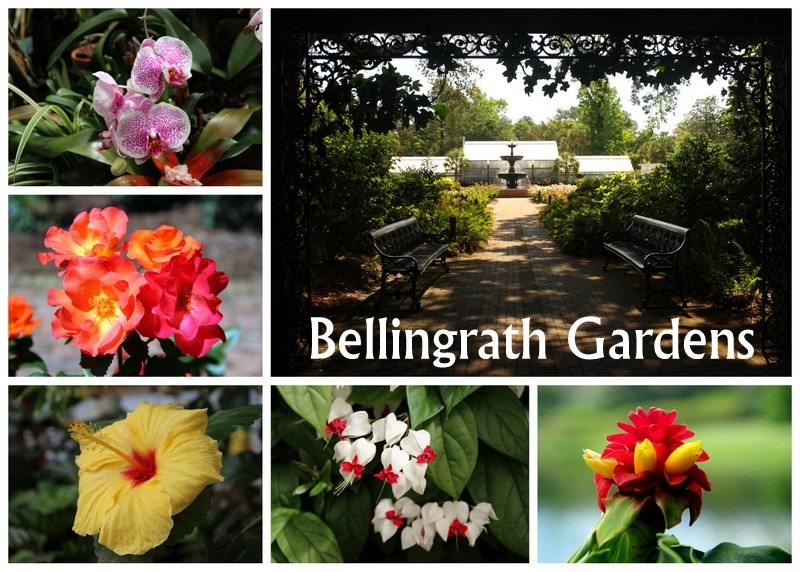 We just visited a beautiful place near Mobile, Alabama called Bellingrath Gardens. As you may have guessed, there were lots of beautiful flowers there and I used Picasa’s Collage tool to put several of them together into one picture. 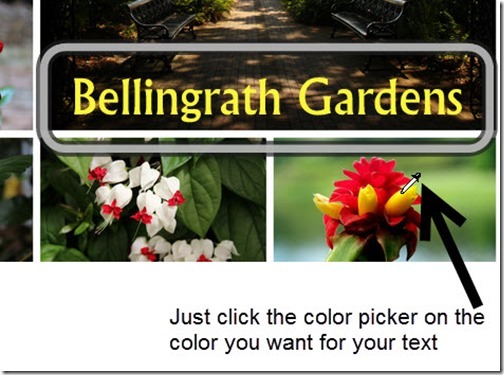 Then, I wanted to type the words, “Bellingrath Gardens” on the resulting collage. 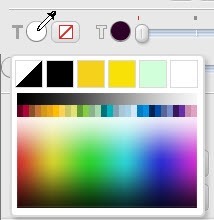 When you click on the color options for text (or background, or borders) you will immediately see a color palette and you can then click on any color of the rainbow by using that color palette. But, what I think is even better, is that you can pick any color you see on your screen! 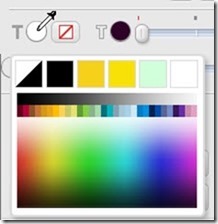 Notice that your cursor changes when you’ve clicked to change a color. Your arrow, or pointer, becomes a little eye dropper icon. That’s called the color picker. It means you can click on any color and it will pick up that color and use it for whatever object you are coloring. So, in my flower collage, I want the text of Bellingrath Gardens to be that bright yellow from the flower in the lower right corner. 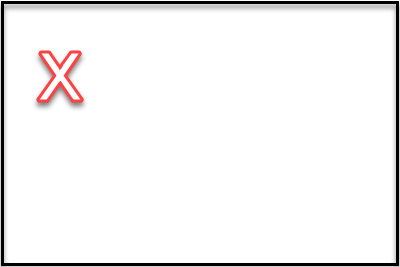 First you click on the circle to the right of the solid T – that indicates you want to specify a Text color. 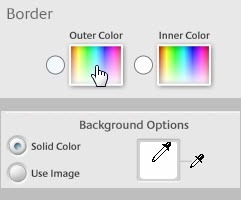 Now, your cursor becomes a color picker, move your mouse over the area with the color you want – you should see your text change color even as you just hover over the different areas. When you get the color you want, click. The same is true anywhere that colors can be specified. For example in the background of a collage, or the color of a border. Wherever you can specify a color, just click on the color control, your cursor becomes the color picker, and you can click on any color you see on the screen. note 9/15/2013: Creative Kit has been discontinued. 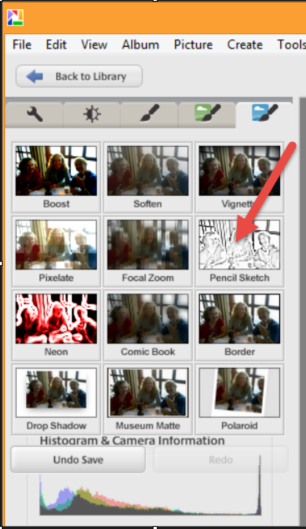 The reason I forget about the “Edit in Creative Kit” button is that it is different from every other button in Picasa. It takes you to the web and uses tools there. If you have a really fast Internet connection – it works great. If not, be patient, it takes some time. Once you’re there, you’ll find the speech bubbles on the Decorate tab. Pick the look you want, and it is instantly placed on your picture. You can move it, size it, and rotate it. Speech bubbles and other decorations you can place on your picture are called ‘Stickers.’ You will see a dialog box called ‘Sticker Properties’ where you can pick a color. Next you want to add text. Although you can do this back in PIcasa, it’s advisable to use the Creative Kit Text tools so you can adjust the baloon and the text to fit properly. 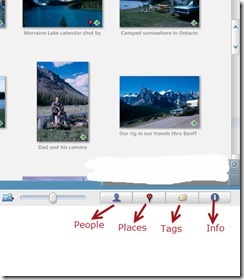 Once it looks how you want, you click the ‘Save to Picasa’ command in the upper right corner. You will be given an option to save a copy or replace the original. This is also different from the native Picasa tools. I recommend you save a copy because Undo will not be an option. It wasn’t so long ago that making a movie like the one below would takes hours, days, maybe even weeks to put together. It would also take some very expensive and specialized equipment. 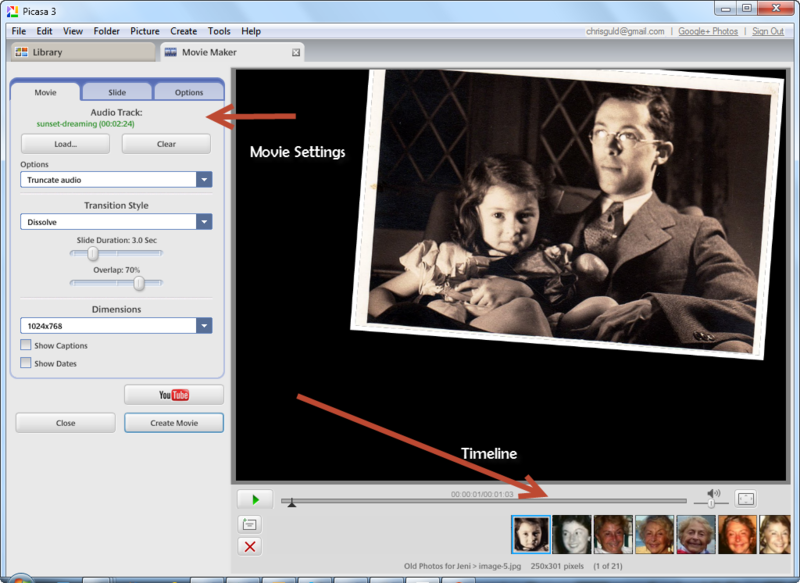 Now, with Picasa’s face recognition feature, it’s just a single click on a button called Face Movie! Just select the pictures, click the Face Movie button, add music, and voila! Here’s a movie of my Mom’s beautiful smile thru the years! You need to have Face Detection turned on and some faces identified in People Albums in order to use this feature. If, at some time in the past you decided you didn’t want Face detection, you can turn it back on with Tools –> Options –> Name Tags –> Enable Face Detection. Assuming you do have a few People Albums, take a look at the buttons next to the thumbnail of that person, you will see 4 buttons. So, just click that button and you will be taken to the Movie Making page, with all the pictures of that person selected (or whatever pictures you pre-selected.) Here is where you will see a few options also. All the pictures have been placed on a timeline. First you’ll want to click the green play arrow and take a look at the movie, then you might try playing with a few of the settings. You’ll definitely want to find a piece of music and ‘Load…’ it into the Audio Track. Notice the audio options to truncate the music, Fit Photos into Audio, or Loop Photos to Match Audio. They each have their place. If you have an audio clip that is the right length for your number of pictures, then Fit Photos into Audio is great, your pictures will end exactly when the music ends. You can drag pictures around on the timeline, you can even remove them by clicking the X at the left. You can also create title slides by clicking the icon above the red X. When your movie looks good, finish it by clicking the Create Movie button. This will produce a .wmv file completely independent of the original pictures. 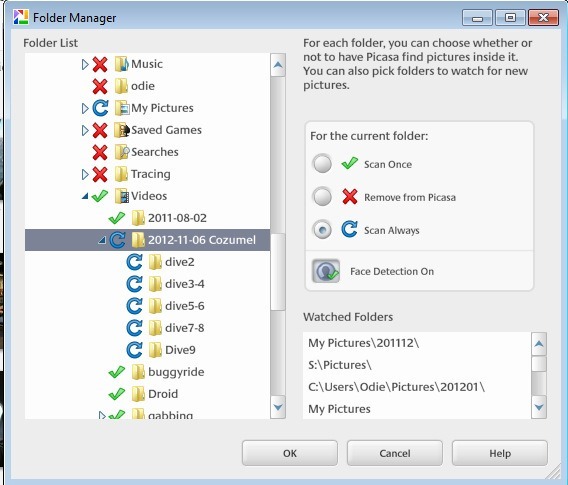 You can copy that .wmv file to any computer device, or you can burn it to a DVD movie using something like DVD Maker. You can even upload it to Youtube, with the handy button provided. Many of today’s cameras take both pictures and videos. 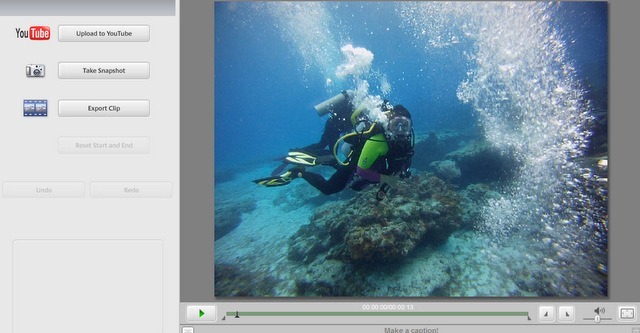 Did you know that Picasa can show you the videos as well as the pictures? 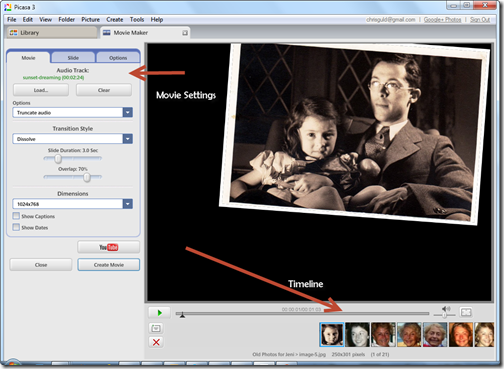 If you took any movies with your camera, they will be imported right along with your pictures when you import the contents of your camera’s card to your computer. 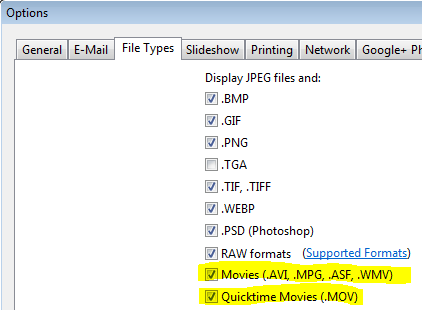 If that is not happening for you, then check your settings in Picasa: Tools –> Options –> File Types and be sure all of the ‘Movie’ file types are checked. 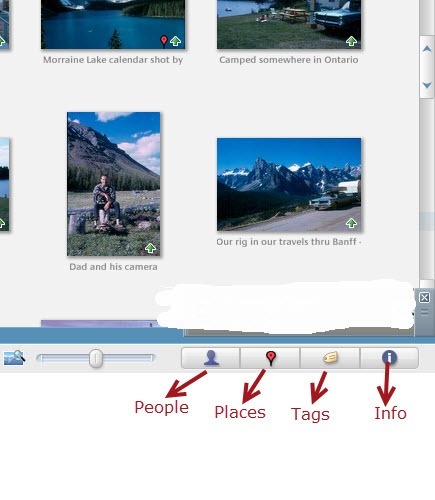 You can identify a video file in your Picasa Library view by looking for the little filmstrip icon in the lower left corner. It’s important to understand that any video will be a large file. Even a 30 second movie taken with a low resolution camera will be dozens of megabytes, and a 2 minute high resolution video will be several hundred megabytes! To see how big any file is, just select it and look at the status line in Picasa – the blue line below the picture or library. This large size makes them difficult, sometimes impossible to upload or even just to play. Be aware of the size of your file. 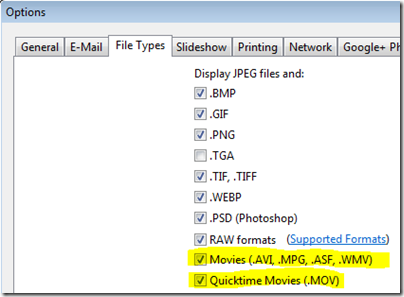 What Can You Do with Movie Files? First of all, you can play them using Picasa – just double-click like you would to open a picture. They might play a little rough and jerky – Picasa is not the best video playback software around, but it does work. You can also pause by clicking the button with the two vertical bars, and play by clicking the green arrow. You can shorten them by setting a new Starting Point and Ending Point. Just position the playhead at either end and click one of the triangles to the right of the video. When you hover over them, you’ll see ‘Create a new starting/ending point.’ Now when you play it, it will start at your designated starting point and end at your designated ending point. You can Upload to Youtube. All you need is an account – it’s free. Youtube is owned by Google, if you already have a google account – you’re all set. You can capture a snapshot. Just position the video at the frame with the shot you want as a picture and click the ‘Take Snapshot’ button. You will now find the .jpg file of that shot in the ‘Captured Videos’ folder of the Projects collection. You can Export a clip. If you have set a new start or end point, clicking on Export a Clip will create a new video file that starts and ends at your points. 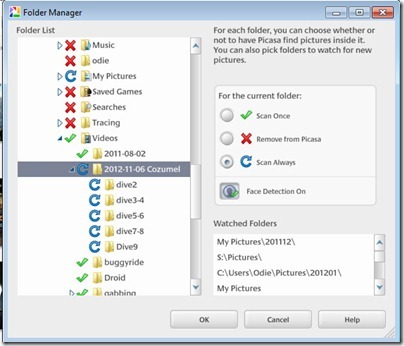 Other than setting new start and end points, you cannot do any further editing of video files. There is no color correction or cropping etc. available for movie files. If you want to learn how to do all of these editing techniques – “There’s a video on that!” Take a look at ourLearning Library for Picasa – the first 3 videos in the list are free for anyone to watch, the rest require a Geeks on Tour Membership.